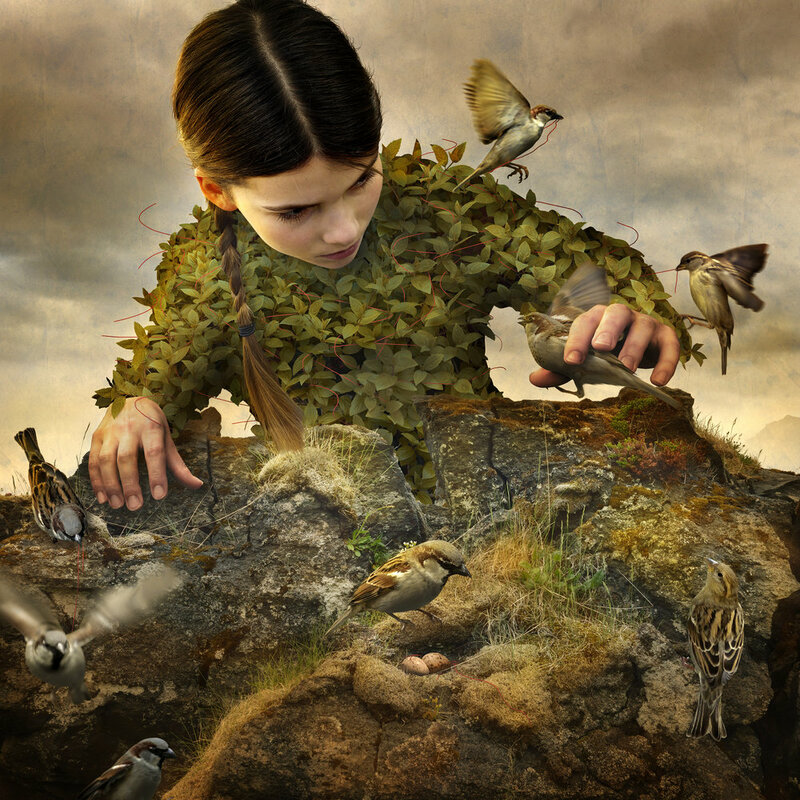 The image on the cover of Issue VI is Hidden Aviary by Tom Chambers. Our editor Alina Rios was lucky to catch a few minutes of Tom’s time to ask him some questions about his creative process, inspiration, and stories. AR: First of all, I have to say that your work is stunning. I'm particularly interested in where you shoot the landscapes for your images? TC: Thank you for your feedback. I’m assuming that your readers know that my images are photomontages. I photograph the backdrop or landscape and each element (animal, child, props) separately. All the elements and landscape are combined to create one image. Now getting back to your question. Yes, I love to travel and I take my camera with me. An interesting backdrop always adds a sense of beauty to each image. I have traveled to Iceland twice and love the unique backdrops I’ve been able to capture in Iceland. Other landscapes have come from my home state of Virginia, the southwestern USA, Mexico, Italy, Canada, and Scotland. AR: Each image seems to tell a story. Do you know this story? TC: I generally have a story in mind when sketching an idea for an image. These stories (or images) usually come to me when I’m relaxed or lying in bed, almost asleep, in that space between sleeping and being awake. At that point I will make a small thumbnail sketch to keep me from forgetting the story. I like to think of my stories as being unfinished, allowing the viewer to interpret or complete the story. AR: Does the story change as you are out in the world collecting the pieces that make it? TC: That’s a great question. My sketches are very small and rough. Basically, they keep me headed in the right direction. But I love it when my images take on a life of their own and change the direction or meaning of the story. It’s something that never fails to excite me or keep me interested in the image I’m constructing. AR: As you're reviewing the components to be brought together in the final image, how do you know that you've found the right combination? TC: I don’t, and that’s what makes this particular medium so interesting to me. It’s similar to completing a jigsaw puzzle, except there is not one single correct answer. In building an image, there are certain things I need to keep in mind. For example, all elements in the image need to have the same directional light source. The light must have the same intensity in all the image pieces. All elements must have a similar degree of focus. So for example, consideration must be given to elements that are farther away because they are less in focus. Color intensity needs to be consistent across the image. AR: The heroines of your work are young women. Can you speak about how you've arrived at this? TC: When I started making photomontage art, my daughter was very young and I used her in a lot of my images. I could see that she had a connection with animals and enjoyed being around them. Children and animals share an innocence and vulnerability, which I have portrayed in my photography, giving it a fairy tale quality. As my daughter grew into her teens and young adulthood, I became interested in the idea of transition and growing experiences for females. Another reason for using young women in my work is that the viewer seems to have more empathy with girls. Furthermore, I use the girls’ clothing as a design element because it helps to set a mood and has a beauty that boys’ clothing does not. AR: What is your source of inspiration? TC: I have been inspired by painters, such as Winslow Homer and Andrew Wyeth. I grew up in Wyeth’s area of the country and understand his palette. Further inspiration has come from magic realism authors such as Toni Morrison, Cormac McCarthy, and Gabriel García Márquez. Travel and exposure to new cultures energize me. As much as I hate to admit it, social media such as Instagram and Facebook provide an opportunity for viewing a wide range of art and discovering sources of inspiration. I’m continually seeing new and exciting art posted by my contemporaries. AR: And finally, where can we see more of your work? TC: Thank you… Hearts and Bones—a retrospective book of my nine completed photographic series was recently published by Unicorn Press, a UK publisher. I’m very happy with how the book turned out. It’s a hardback, 11” x 11”, 208 pages with 125 color images. Signed copies can be purchased at photo-eye Bookstore. It also can be found on Amazon. Photographer Tom Chambers was raised in the Amish farm country of Lancaster, Pennsylvania. Tom completed a B.F.A. in 1985 from The Ringling School of Art, Sarasota, Florida, majoring in graphic design with an emphasis in photography. Since 1998 Tom has exhibited photomontage images from nine photographic series both nationally and internationally in twenty-three solo exhibitions and over seventy group exhibitions and art fairs. Tom has received fellowships from the Virginia Museum of Fine Arts and the Virginia Commission for the Arts. Tom’s photography is held in the collections of the National Museum of Photography, Bogotá, Colombia; California Sate Polytechnic University; Santa Barbara Museum of Art, CA; Santa Fe Museum of Art, NM; Museum of Contemporary Art (MOCA), Bangkok, Thailand; Texas Photographic Society; City of Jacksonville, FL, Art in Public Places; University of Texas; Sir Richard Branson, personal collection; and the Royal Caribbean Cruise Lines. Tom’s work has been published in multiple publications and books. Entropic Kingdom, containing images from five series, was published by Modernbook Editions in 2012. Galerie Vevais published Werkdruck No. 6 in 2015 featuring his “Illumination” series. A retrospective book, Hearts and Bones, containing images from his first nine series, was published by Unicorn Publishing, London, in 2018. See more of Tom’s work on his website at http://www.tomchambersphoto.com.